Recycling is having a bit of a wake-up call. Until this year, two thirds of the materials collected from curbside recycling carts were exported to foreign markets. Recent, sudden changes in China’s acceptance of mixed plastics and mixed paper (junk mail, newsprint, office paper, etc.) mean fewer places to recycle these materials. It’s a problem affecting communities across the U.S., Europe and Australia. To date, no cities in Alameda County have had to send sorted mixed paper or mixed plastic to landfill. However, the situation is evolving daily. For many of us in the Bay Area, being a good recycler is part of our identity. Our careful recovery of materials goes back decades to the first half of the last century with resourceful scavengers maximizing reuse of materials such as bottle washing and using organic waste for hog feed. In the 1960s, San Francisco garbage collectors were separating bundled newspapers for recycling when nearly no one else was. 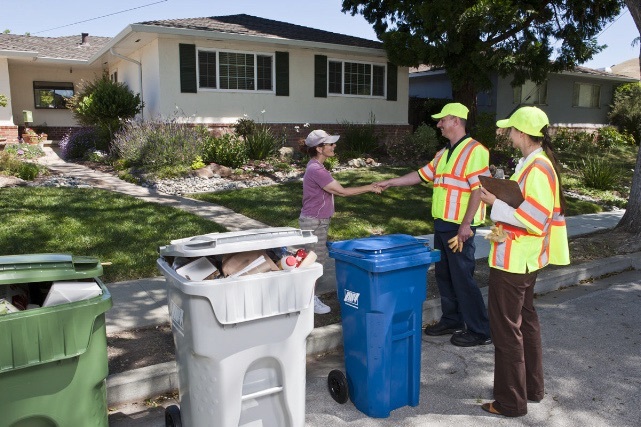 Berkeley had one of the nation’s first voluntary curbside recycling collection programs and enterprising salvagers who focused on reuse like Urban Ore. Livermore had one of the first contracts with a recycling company to pick up curbside items citywide. The cities and waste haulers of Alameda County and San Francisco were among the country’s pioneers of collecting food scraps in curbside and commercial organics bins to produce compost, a vital amendment that improves soil health while minimizing the amount of harmful methane gas created when organic material is landfilled. Visit www.StopWaste.org/recycle for tips on using less. Recycling bin: Items going in the recycling bin should be empty, clean, dry, and free of food and liquids. State, regional, and local jurisdictions and the recycling industry have worked for many years to instill good recycling habits among residents and businesses. It’s not time to switch these habits off, but rather to show leadership and redouble our efforts that build on the successes and traditions our region is known for.